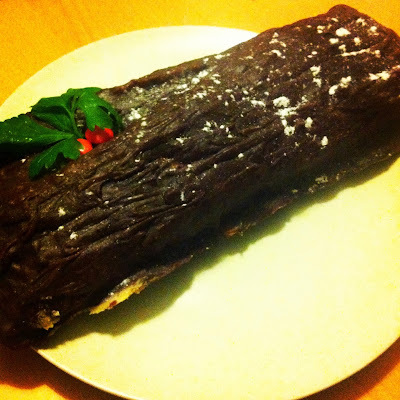 This Christmas we attempted to make the traditional Bûche de Noël (Christmas Log Cake), with more success than last year. I like this cake because of the dense packed tea cake texture of the sponge (genoise) and the rum and chestnut cream filling. It's a bit sweet on its own for me, but goes perfectly with a flute of bubbly champagne at midnight on Christmas Eve! Here's the recipe we used, it's not too difficult, I'll say the hardest part is the rolling of the sponge. 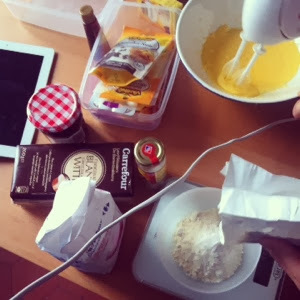 Oh and bringing yourself to add the amount of butter and sugar in the recipe. I usually turn a blind eye when John adds the butter and sugar because I get too scared watching that part. Plus, I know I'll enjoy the cake more when I'm unaware of those quantities. Beat the 4 egg yolks with the sugar until whipped and whitened. Add the flour, cornstarch and melted butter. 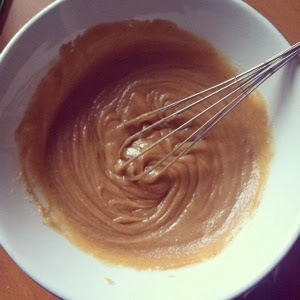 In a separate bowl, beat the egg whites until slightly stiff then gently fold into mixture. Prepare greased baking paper on a tray of about 40cm x 25cm in size. Lay out mixture and bake for 8-10 minutes at 180 degrees (in pre-heated oven) until the sponge is lightly golden. Wet a clean tea towel, wring then lay out on the bench. Quickly bring the sponge to the tea towel and remove the baking paper. Gently roll the sponge and leave in the damp tea towel for 30 minutes. While the bûche is cooling down, mix the chestnut cream with the softened butter and add the rum. After 30 minutes or so, transfer the bûche onto some cling wrap and gently unroll. Spread 2/3 of the filling onto the sponge. Roll up the sponge again. Melt the dark chocolate and combine with remaining chestnut cream mixture. Cover the log in this mixture then use a fork to drag along the surface of the bûche to create grooves and log-like texturing before decorating with whatever you like. We used some red M&Ms with some sprigs of parsley for holly and some icing sugar for snow. Refrigerate the bûche for 12 hours, if you are pressed for time, it can be popped into the freezer briefly to speed up the cooling process.